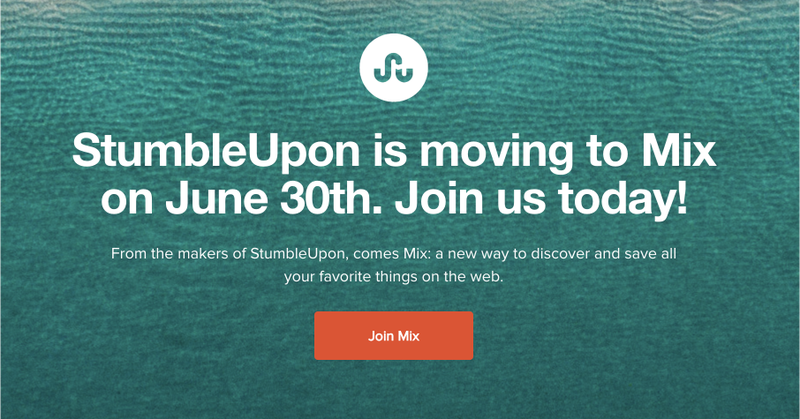 Come June 30th, you will no longer be able to click on that little StumbleUpon icon to discover new websites. StumbleUpon is shutting down, and its makers are putting all their energy into founder Garret Camp’s other venture. No, not Uber, which he also also co-founded. But Mix. As TNW notes, Mix is kind of like if StumbleUpon and Pinterest had a baby. Only, fewer people click on that baby than on its parents, which means Camp is basically killing a parent so its precious baby can hopefully absorb all its powers and become a super popular baby that lets people pin blogs they like. Hopefully it will be more useful than the hellscape called Pinterest, which is very good at getting clicks through SEO wizardry but very bad at actually connecting the curious with the curiosities they seek. StumbleUpon was never about SEO, but it was, once upon a time, a major traffic driver for people eager to popularize their blogs. Googling StumbleUpon today sends you to the same kind of sites as googling SEO; overly technical blogs explaining every little hack you can do to manipulate the site for traffic. Yet the site’s relevance has diminished significantly over the years. By one metric, traffic produced by shares on StumbleUpon fell nearly 43 percent in one year. That’s a pretty potent death knell. And the death itself was announced on StumbleUpon’s front page, which notes that all our old StumbleUpon accounts are being migrated to Mix. It was also announced in a blog penned by Camp on Medium. The blog paints StumbleUpon’s death not as a tragedy, but as a triumph. It was merely the first generation of content curation, and Mix will be even better. He also notes that StumbleUpon was doing the social media and content curation mash up years before Facebook or Twitter or Reddit, which is totally true! But it never quite thrived like those later offerings. Instead, in 2013, it laid off 30 percent of its staff. Then Camp, one of the original founders of the company, returned and reacquired it, paying pennies for shares. Since then it’s just sort of lingered. Camp’s decision to shutter the service isn’t so much a surprise as it is a courteous bullet to the forehead after a very long and slow death. Peace out StumbleUpon. You gave that one blog I wrote in 2011 a nice traffic bump.